We get a lot of visitors in summer so our linens get an extra workout. Thankfully there's a good stack of pillow cases already ironed because there hasn't been much time for that lately! I like to rotate my vintage collections so that they get less wear and can last longer. Even so, some of my newer all cotton sheets are wearing thin. Time to look out for more! These are some of my mix and match favorites of which many of you have seen on the blog before. I am always adding vintage white pillowcases with crochet trim when I can find them, especially in singles. They are delicious together, and I love a white bed! Love finding pretty designer patterns at the thrift store too. These are RL. Love just a white chenille bedspread as a blanket for hot summer nights. Perfect to pull up when it gets cooler in the ealy morning. A one of a kind find. So cheery. I'm probably boring, but I use mostly the same colorways in all the bedrooms. This is a nice summery damask tablecloth with a pink stripe. Love the flower design. We're already saying goodbye to June. We have guests all weekend to celebrate, so the clotheslines are getting a workout. . . . 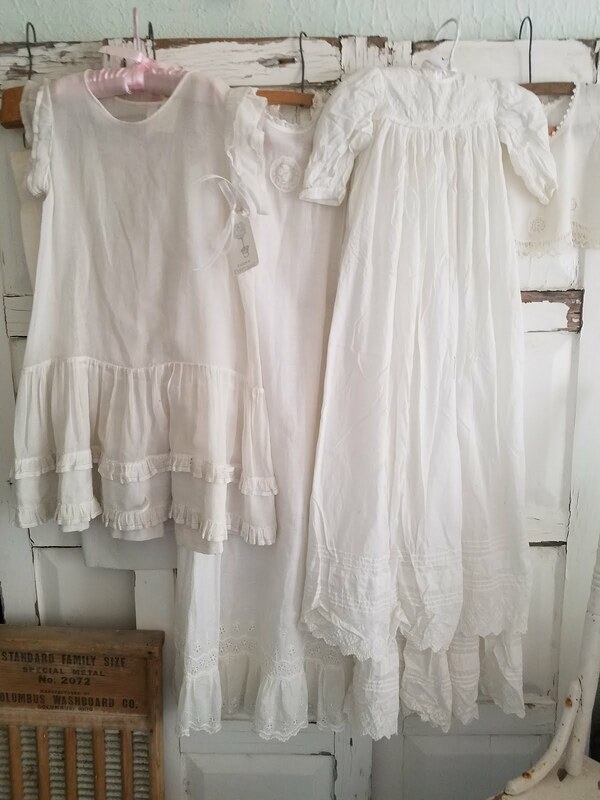 The linen dries so fast in the intense dry NM heat that the sheets almost appear to have been already ironed. Nice bonus! Finished and smelling delicious in no time! The top sheet shown here is a vintage Dan River rose print. Love it when I find one of those! A fifties print tablecloth with cherries and strawberries. What could be sweeter! When there is plenty of time to get ready, preparing the guest rooms is a nice ritual. Even the very young enjoy a cozy bed! Finally, I am showing a couple of my favorite tablecloth arrangements for outdoor dining with some pretty china mixed in. . . .
Love a table with a sweet petticoat! 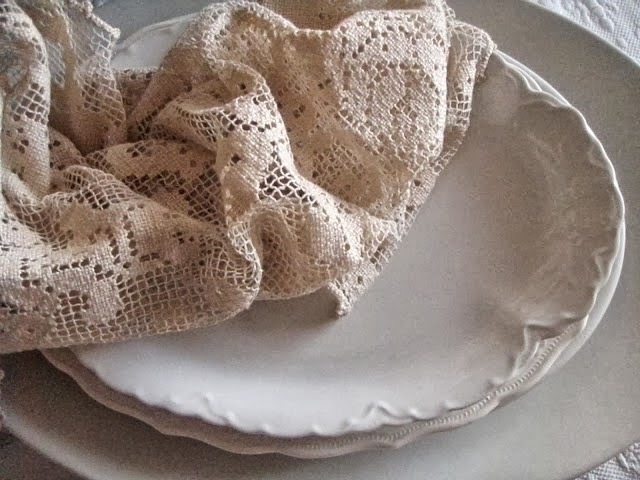 Hand crocheted lace underneath and a vintage curtain panel as a table cover on top. A similar treatment with a woven lace tablecloth underneath. This is a good trick for old laces that are less than perfect. The extra frill adds so much! This time it's a twin bed skirt that peeks out underneath. Vintage linens go such a long way toward making a summer memorable. For me, it's one of the real joys of the season. The weekends are so full in summer! I hope it's a nice one for you! All the little girls are off doing summer awhile until we meet again. There's summer camp 'this and that' : ballet camp, church camp, music camp. But if there was summer camp for me . . . I would want there to be tiny summer cottages, perhaps by the sea, furnished with white-washed cupboards inside. Not too hot, with crisp white linens snapping in the breeze. We would build vignettes in lieu of sand castles. Beds all cool and smooth, and lavender at end of day. Roses and seashells, and white pennants flying. Evenings full of twinkle light. Pretty teas, and no talk of diets. Maybe we can get Disney to work on it! Haha! 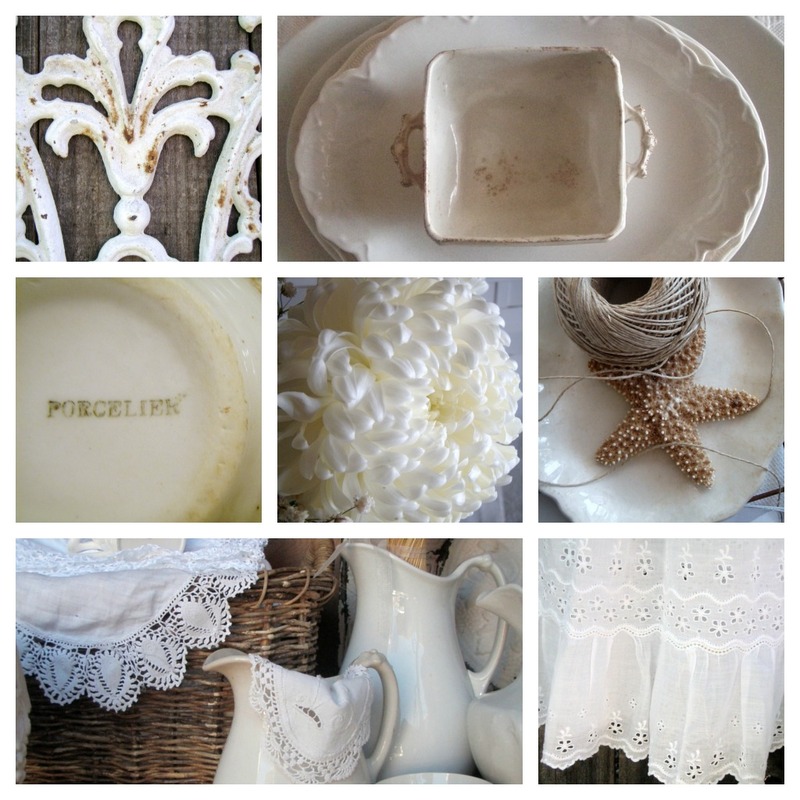 In the meantime, enjoy a few peeks at my favorite summer whites. . . .